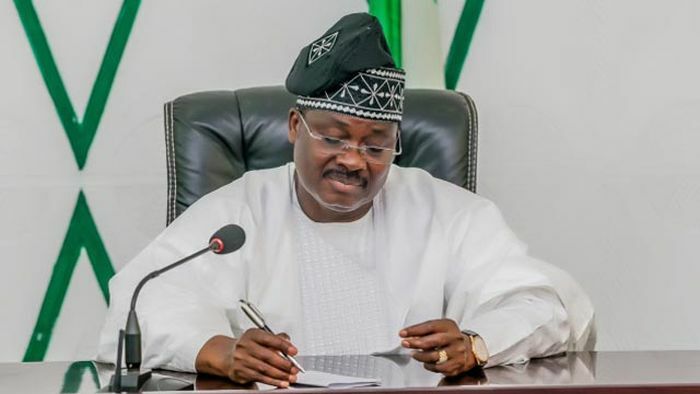 Abiola Ajimobi, the outgoing Governor of Oyo State, is set for a head-to-head battle with Joseph Tegbe, governorship aspirant of the All Progressives Congress (APC) in Oyo State, and Adebayo Adelabu, governorship candidate of the party, to become Minister when President Muhammadu Buhari reconstitutes his cabinet at the start of his second term. The three-way battle for a ministerial slot is a direct consequence of the party’s woeful outing in the general election in Oyo State. Before he was pressurised into stepping down for Adelabu right at the convention ground for the Oyo APC governorship primary in September 2018, Tegbe was promised ministerial appointment. This was further confirmed last week when 11 prominent Oyo politicians under the name Otunba Jimi Tegbe (OJT) Vanguard openly attacked Adelabu for his criticism of Tegbe after losing the governorship election. The OJT Vanguard had said they were “convinced that the aim of Adelabu’s recent outburst is simply to subtly sabotage the proposed assigned role of Honourable Minister to be given and reiterated several times to our principal and party faithful who were so aggrieved that the gubernatorial ticket was denied our principal”. They had also said the ministerial offer was “well-announced after Joseph Tegbe heeded to the plea to step down for the party consensus in the interest of peace and unity”. In the last few days, however, Ajimobi, who hitherto endorsed Tegbe for ministerial appointment, thinking he would win his own senatorial election, has now been showing interest. Adelabu, who was also expecting to be elected Governor of the state and was therefore supportive of the ministerial slot for Tegbe, is now expecting the party to compensate him with a ministerial position that he can build on to recontest in 2023. “Ajimobi feels that since he contested but didn’t win, he deserves to be Minister to maintain his political relevance,” a source familiar with unfolding events told SaharaReporters on Sunday. “When Tegbe was told to step down for Adelabu, he was promised a ministerial position, under the assumption that Ajimobi and Adelabu were going to win elections. The Governor was doing Tegbe’s bidding, thinking he and Adelabu would win and then back Tegbe for Minister. Adebayo Shittu, who is currently Minister of Communication, and a former Oyo APC governorship aspirant, is not left out of the drama. SaharaReporters understands that Ajimobi, having been Governor, is the leading candidate to get the slot. However, something that could count against him is that he is currently out of favour with Bola Tinubu, National Leader of the party, who believes, like many others, that Ajimobi’s unpopularity with the people is the single biggest reason for APC’s loss at the polls. The Oyo APC is scheduled to hold a meeting today to x-ray why a party that won nine house of representatives and two senatorial slots ended up losing 28 of 33 local governments two weeks later. The post Ajimobi Fights Head To Head With Tegbe, Adelabu For 1 Ministerial Appointment appeared first on Naijaloaded | Nigeria’s Most Visited Music & Entertainment Website.